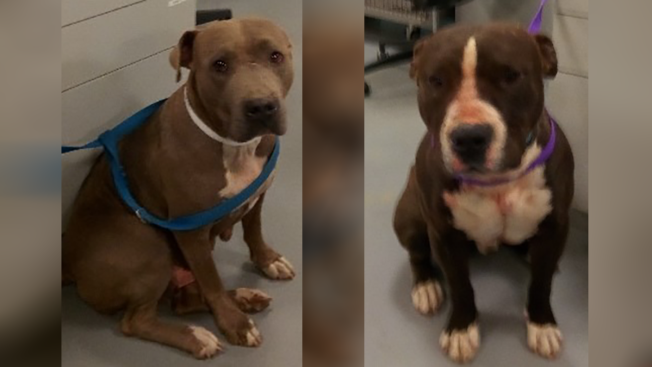 Two of the three dogs suspected of attacking a woman in Anza on Saturday, Dec. 15, 2018. The owner of the dogs was arrested after the incident. A California woman suffered serious injuries and had to be airlifted to a hospital after she was attacked and mauled by three dogs in the unincorporated Riverside County area of Anza Saturday. The attack was reported just after 9:40 a.m. in the 55000 block of Mitchell Road, according to the Riverside County Fire Department. A responding officer for the Riverside County Department of Animal Services described the victim's injuries as "severe,'' according John Welsh, a spokesman for the department. "All three [dogs] were pit bulls or pit bull mixes and there is a known owner,'' Welsh said. The woman was attacked on her own property while she was believed to be hanging laundry, according to Welsh. The dogs involved in the attack were impounded at the San Jacinto Valley Animal Campus and animal services was seeking a permit to euthanize them, he said. The owner of the dog was believed to have a felony warrant and was arrested by sheriff's deputies after the incident, Welsh said. The name or age of the victim was not disclosed, and her condition was unknown. "It's imperative that owners of these types of dogs do everything in their power to prevent such horrific attacks," Animal Services Director Robert Miller said.